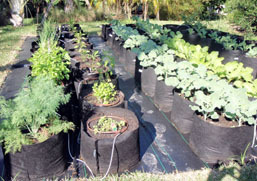 Edible landscapes are an attractive way to produce fruits and vegetables for home use. You can create an entirely edible landscape or incorporate simple elements into your existing yard or garden. By growing vegetables, herbs, fruit trees, and berries in a JackPot growing system, you will find immediate rewards by saving time and money while enjoying the benefits of food from your own landscape. Maximize your property's potential by growing edibles. 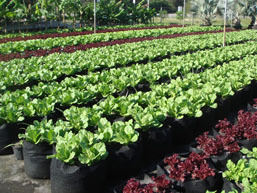 Jackpot growing containers are simply the best method of growing above-ground. Results continue to astound our customers as they discover the many advantages to our patented containers. 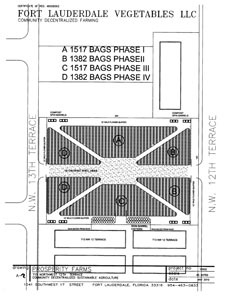 Garden plan, shown below left: JackPots are a main component in the future trend of localized food production, large and small, as shown in this plan for Ft. Lauderdale Vegetables, LLC. JackPots provide moderated root zone temperatures, dramatically improved drainage through the entire container, and aeration to the soil due to excellent air flow through the fabric. This air flow creates air root pruning, creating masses of fine feeder roots which accelerate plant growth and minimize disease. Gardening in JackPots greatly reduces your time and labor. No more tilling, digging, weeding and planting for hours -- it is simply not necessary. Incredibly outgrow conventional gardeners! Grow faster, larger and better-tasting produce than the earth-bound competition. Now you can grow healthy, robust vegetables including delicious heirloom tomatoes, amazing celery and carrots, and much more. Everything grows better in a Jackpot! 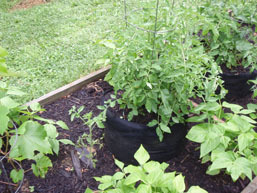 It's easy to improve your container soil in a Jackpot -- simply add your amendments to the first several inches of soil and allow gravity to provide nutrient rich leachate for many months during your growing seasons. Organic growing has never been this simple! Of course if it is necessary, Jackpots can easily be moved to take advantage of ideal light conditions as the season changes. 70 ground staples @ 1" o.c. Vermiposting is a process of composting with worms that will save you time, effort, and a tremndous amount of money. Our 100-gallon Jackpots have become the leading vermiposting container in many gardens. Many gardners compost to keep biodegradable wastes out of landfills and to create a rich, organic matter that can be returned to the soil. Adding worms to your composting efforts will speed up the composting process and even enable you to continue composting in the winter, when most outdoor compost piles (at least in northern climates) are useless in a frozen state. Compost that has been created by vermiposting will be richer in the vital nutrients your plants need. Our 100- and 200-gallon Jackpot Vermiposters are simply the best method for composting with worms. 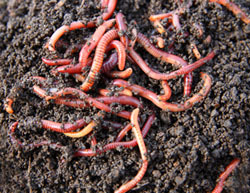 Vermicompost is organic, non-burning and rich in nutrients. Worm casts are suitable for a wide range of horticultural uses. Vermicompost contains eight times as many microorganisms as their feed, which promotes healthy plant growth. The casts are also rich in humic acids, which condition the soil, have a perfect pH balance, and have plant growth factors similar to those found in seaweed. You can start your composting by feeding your earthworms with kitchen waste and by-products: fruit and vegetable scraps, dry bread, crushed egg shells, tea bags, coffee grounds and filters, dryer lint, and other organic waste. Chop or tear the waste into small pieces for quicker decomposition, or you can let the worms do the work for you. To add waste to your compost bin, make a trench down the middle, add the waste, and then cover it back up. The worms will find their way to their fresh food and start munching. Garden waste is the perfect feedstock for your vermiposter(s). Avoid adding refined sugar, meat scraps and bones, dairy products and vegetable oil products (such as mayonnaise and salad dressing); too much of this will draw insects and create odor. When the amount of compost in the bin is reduced and has an earthy, brown appearance, it is ready to use. This process usually takes about three or four months if you have chopped the waste into small pieces, and perhaps six to seven months if you've added it whole. You can use your worms to start another vermiposter. Red worms and red wigglers will reproduce quickly and prolifically. While they are turning your waste into rich compost, your earthworms also will lay worm capsules, which hatch about two dozen juvenile worms each. Oxygen is necessary for decomposition, and the worms absorb necessary oxygen through their membranes. Unlike conventional vermiposting, our JackPots will aerate the compost without the need to mix, stir or turn. Simply put, you will not find a more cost-effective and productive container for vermiposting than the JackPot.